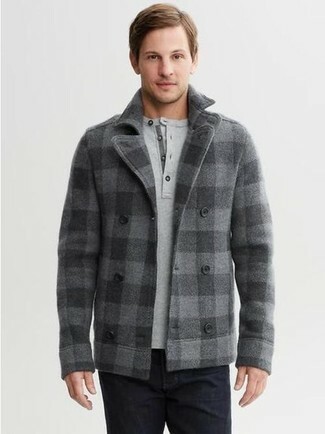 Rock a Hugo Boss Textured Henley from Lord & Taylor with charcoal jeans for a straightforward outfit that's also well put together. This pairing of a Hugo Boss grey henley shirt and navy chinos is well-executed and yet it's laid-back enough and ready for anything. Perk up your getup by slipping into black leather dress boots. 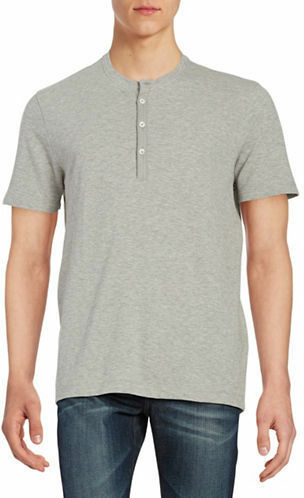 Try pairing a Hugo Boss grey henley shirt with grey skinny jeans for an easy-to-create look. 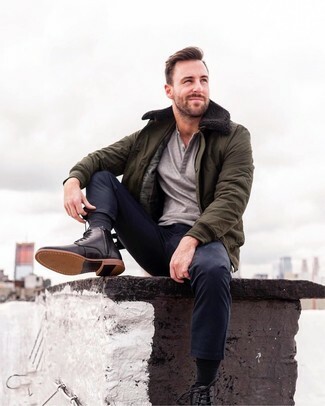 Black leather casual boots will breathe a sense of refinement into an otherwise simple outfit. 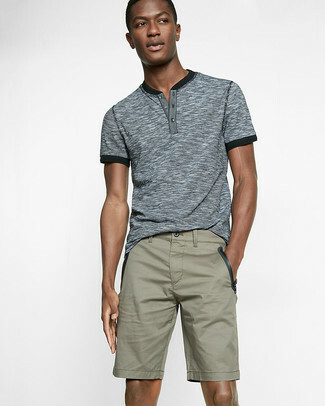 For a laid-back ensemble, wear a Hugo Boss Textured Henley from Lord & Taylor and olive shorts — these items fit perfectly well together. 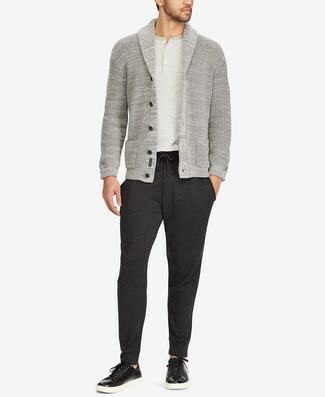 This relaxed casual combo of a Hugo Boss grey henley shirt and charcoal sweatpants is capable of taking on different nuances according to the way it's styled. 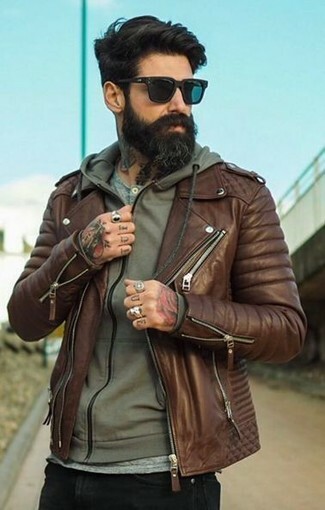 If you need to instantly smarten up this outfit with one piece, why not finish off with black leather low top sneakers? 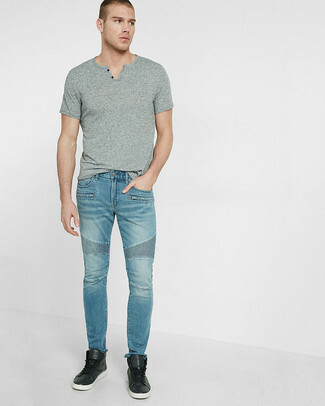 To achieve an off-duty ensemble with a twist, you can rock a Hugo Boss Textured Henley from Lord & Taylor and light blue skinny jeans. A nice pair of black leather high top sneakers ties this outfit together. 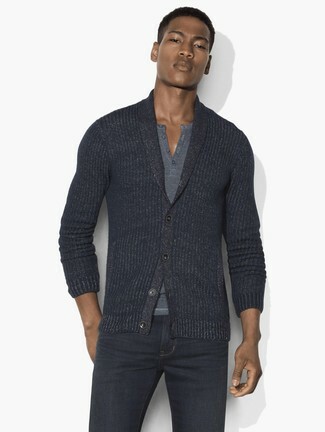 A Hugo Boss Textured Henley and charcoal jeans make for the ultimate laid-back look for any man. If you like modern casual combos, then you'll like this pairing of a Hugo Boss Textured Henley from Lord & Taylor and black skinny jeans. Master the effortlessly neat menswear style by wearing a Hugo Boss Textured Henley and a navy suit. Want to go easy on the shoe front? Introduce white low top sneakers to the mix for the day.